'Even in its unmistakably masala tone, Bajrangi Bhaijaan firmly believes the desire for peace is universal and recommends being a hero. Or just human,' says Sukanya Verma. Children are strange, surreal beings. Their curious, unworldly eyes, cherubic smiles and carefree approach that neither knows guile nor caution can soften the severest of Scrooges and Selfish Giants. Sometimes it even makes heroes out of them. Kabir Khan’s Bajrangi Bhaijaan cleverly exploits this notion by casting an angel-faced six-year old (Harshaali Malhotra) as the emotional core of its cross-border story. The child’s innocent presence aims to mollify the cynical, picky, mindless blockbuster-wary viewer and, consequently, portray her champion, played by Salman Khan, in a favourable light. There’s little of the swagger that triggers mass hysteria among his followers, the Salman in Bajrangi Bhaijaan is humble, subdued and earnest. He has been generally charming around kids -- when fondly referring to Aditya Narayan as “Mere laal, mere kaale, mere peele” (Jab Pyaar Kisise Hota Hai) or blushing at Sana Saeed’s suggestion to marry ‘Yo! Neelam” (Kuch Kuch Hota Hai). 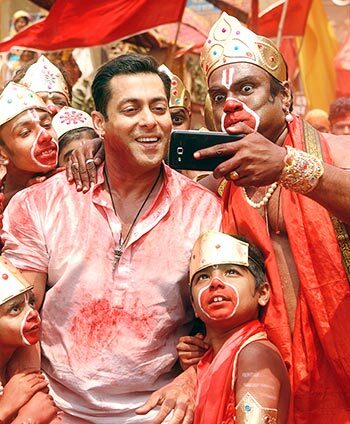 And as the god-fearing Bajrangi, he brings out a Baloo-Mowgli warmth to his interactions with Harshaali too. As Bajrangi, he’s a staunch devotee of Lord Hanuman, a man of conscience, virtue (and free time) whose extraordinary altruism, the kind that’s mostly extinct outside the silver screen, prompts him to help a lost Pakistani girl find her way back home. Because the kid doesn’t speak, the trip takes a while to materialise and offers the duo some opportunity to bond as well as light-heartedly highlight lifestyle differences based on Hindu-Muslim stereotypes. The upshot of this exercise to reveal prejudices, religious bigotry and classist slurs is alternately contrived and droll. Director Kabir Khan goes overboard in a bid to prove empathy conquers all through a silly Chicken number solely dedicated to broadcast shuddh shaakahari Bajrangi’s newly-accquired tolerance for non-vegetarian food. But the exchange between him and a visa official at the Pakistani embassy is tickling. Eventually, Bajrangi’s modesty cannot undermine his might or faith in Hanuman Chalisa. And Human-Man resolves to deliver the kid across the border, no hook, no crook. Which is all very nice except his appeal for “permission” comes dangerously close to sincerity overkill. Bajrangi Bhaijaan wears idealism like Salman wears a mace pendant around his neck. It expects to be viewed with the same naïveté and old-fashioned values it so consciously imparts and revels in. Exactly why Nawazuddin Siddiqui’s entry at this point is a welcome break from this well-meaning but cloying demonstration of integrity. Nawaz is Chand Nawab, a small-time Pakistani TV reporter in pursuit of a big story who inspired by Bajrangi’s selfless quest volunteers to assist him instead. The actor appears quite late in the movie. But once he shows up, the film snaps out of the melodramatic rut, endless mediocre songs and dazzles in his smarts, exuberance and wit. Salman and Nawaz share an exciting dynamic. One’s charisma, another’s craft -- the contrasts in their personality play out well on screen bringing in a flavour that’s fresh and on cue. Together their search acquires the shape of an adventure. Leading lady Kareena Kapoor Khan is glossy as Bajrangi’s benevolent, secular love interest with not enough screen time. But I’d like to see her do better than glycerine-shedding, nose ring-sporting, schoolteacher parts. Cannot fault Mukesh Chhabra’s astute casting though. She doesn’t have the bearings of a typically precocious Bollywood child actor and is, thankfully, herself, which is all this movie needs. Apart from her, Chhabra picks the most perfect actors for the tiniest of parts -- the mother, the cricket-loving kiddo, the agent, the clerk, the sepoy, the cop, the cantankerous old man on whose door Nawaz creates a scene and also a canny Om Puri reminding how there’s a little bit of Kashmir on the other side too. Bajrangi Bhaijaan isn’t the first attempt to promote the possibility of peace between hostile neighbours through exemplary citizens. It has been tried earlier in RK banner’s Henna with a Pakistani village girl endeavouring to get an Indian guy back home against all obstacles. Kabir Khan aspires for a similar objective but swaps the sentimentality and sacrifice of an outsourced heroine to focus on the popularity of its homegrown hero in a ridiculously excessive finale. Still it works like it does in a Manmohan Desai creation because the maker is genuinely committed to the power of miracles. Despite the complexity of the given situation and the dangers it runs into, Bajrangi Bhaijaan’s simplistic politics avoids darkness like a plague. But then wishful thinking never hurt any sentiments. Even in its unmistakably masala tone, it firmly believes the desire for peace is universal and recommends being a hero.